Sundays in Texas are Brunch Days and here in Austin that means for a lot of people, Threadgill’s on Riverside Drive just south of the Colorado River. A huge buffet offers cooked to order omlettes, fresh fruit, pancakes (more like the Scotch variety than the French crepe), maple syrup to put on them, bacon, sausage (think burger style patties not the British Banger), fried potatoes, creamed corn, muffins and eggs in varying forms. Add to that fresh orange juice and endless coffee and you probably don’t need to eat for a week! Total bill just over $30 for two. The place was packed and it being late Sunday morning a band was playing country and western style gospel tunes. Families, couples and groups of friends looking for hangover cures queued for tables. The staff were friendly and laid back. I spied one older couple sipping margeritas long before the sun was over the yard arm! 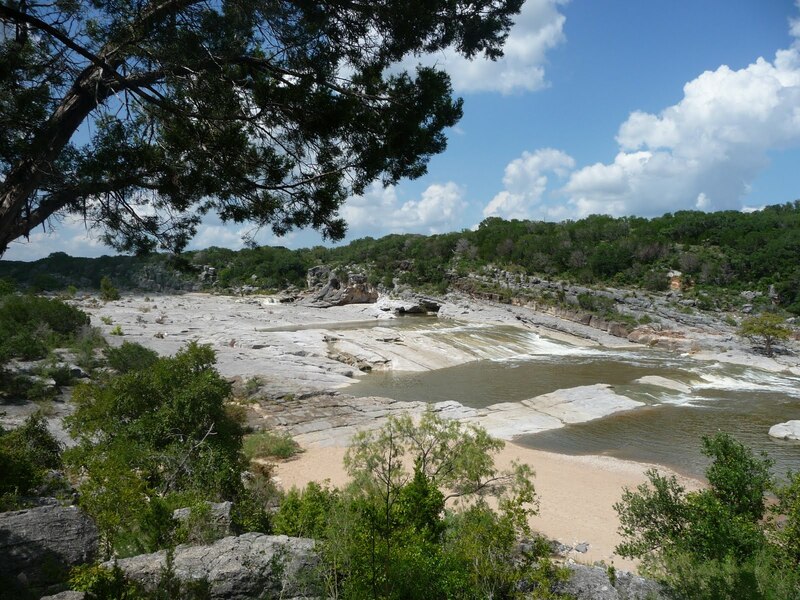 Once we’d paid the bill we headed out of Austin for a bit of recreation at Pedernales State Park 30 miles or so away. We definitely wanted to see the falls in spate but also hoped that despite the huge amounts of rain that fell last week as Tropical Storm Hermine passed over Austin, we’d be able to swim. Muddy water was running hard over the falls but not as much as there had been a day or two earlier: See these piccies on Facebook. The falls aren’t one big drop but more a series of undulations in the rock strata like large weirs and there was a fair amount of water roaring over them. It was a cloudless midday with temperatures in the high 90’s F or around 35C so after the walk down and a short stroll over the rocks to the lowest part we were too exhuasted to do much more than climb back up the steps and path to shade and aircon of the car. A little drive back through the park brought us to the swimming area car park. We drank all the water we had then headed down the valley once again towards the river. There are several miles of swimming area but we simply changed into our cossies at the first unoccupied piece of shade under the nearest tree, spreading our sweat-soaked shirts out on a branch to dry out! Typical of any old river bend there were cliffs on the far side and a tree lined beach on our side. The river was running hard, being mud coloured it was difficult to spot underwater objects and keep a grip on something stable. But the best fun was to allow yourself to be swept downstream, avoiding the larger obstacles of course, then stand up in the knee deep water and wade back to repeat the process. One mum (or mom) was releasing her two young boys in turn to “swim” to daddy standing 50 yards or so downstream – much better than a day at a water park! The water wasn’t chilly and combined with a light breeze and a few clouds Kevin & I soon recovered from the heat of our falls walk. We stayed mostly submerged in the water like a pair of hippos for a good couple of hours occasionally trying to make for the rocks on the further bank with greater or lesser degrees of sucess. If you got there your reward was that is was much easier to wallow in the calmer waters behind a rocky outcrop without having to cling on. The riverside beach was empty of people, everyone was sitting or lying in the water in small groups scattered down the river. And as usual for Texas it wasn’t long before we were being chatted to. One sun-hatted group lazed in the water drinking from ostentiously large plastic beakers (“it is an offense for any person to consume or display an alcoholic beverage in a public place”), another individual was snorkling though even he had to admit that he couldn’t see anything! 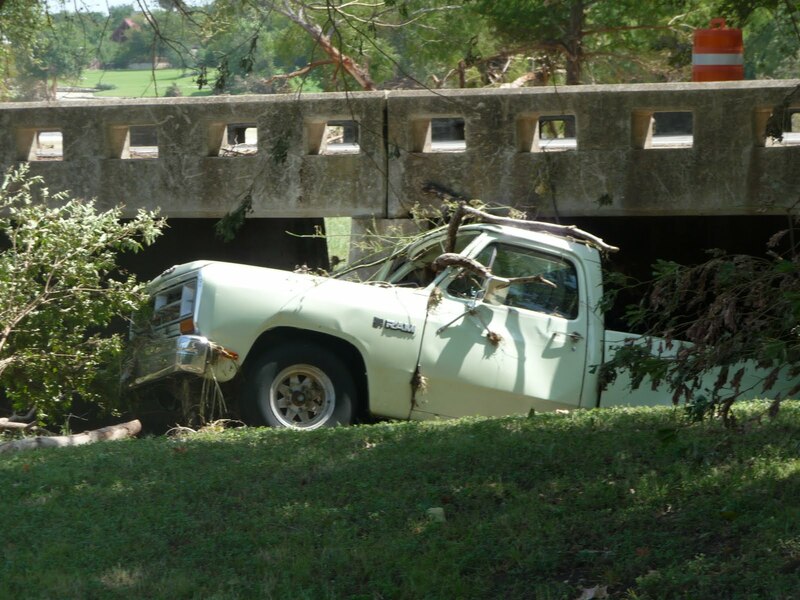 An elderly Indian gentleman beat his grand-kids into the water and a middle aged couple found a pleasant spot in a nook in a large mid river rock, in the sun and breeze but out of the stream, just room for two. I doubt you’d want to spend so much time in any UK river, even in the middle of summer the Dart in Devon is bone chillingly cold. There are plenty of good things about the Texan way of life and its been a privilege and a pleasure to enjoy some of them over the past few weeks. PS: In case you are in any doubt about the power of a river in flood here is a photo I took on Friday in the small town of Salado north of Austin. 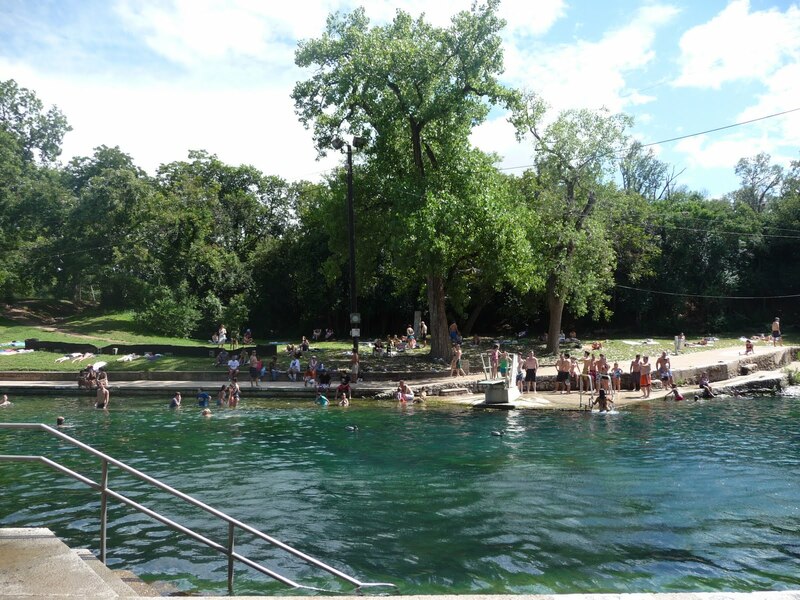 Or compare this photo of Barton Springs swimming hole from the local news station KXAN’s website (spot the life guard chairs)…. with this one I took just a couple of days earlier when we were there swimming! Have you had a chance to try moonshine's brunch yet?